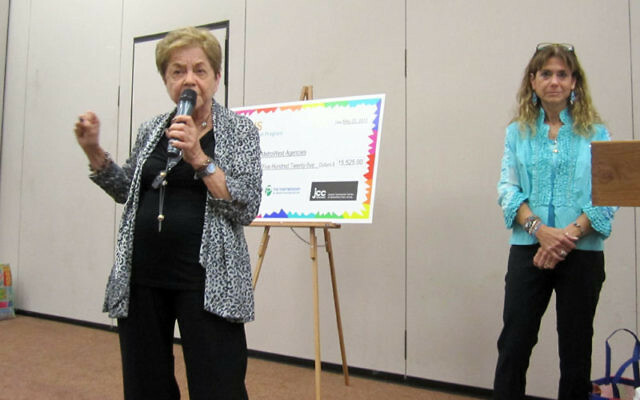 Milly Iris, left, speaks to the more than 110 who attended the 2011 Teen Tzedakah grant presentation about the importance of life-long giving as daughter Roree Iris-Williams, right, looks on. While an audience of individuals who have long made community involvement a part of their lives were gathering in Whippany to hear Jewish Agency for Israel chair Natan Sharansky speak, 37 younger individuals were just down the hall on the Aidekman campus attending the Iris Teen Tzedakah Program’s gala dinner and showing an equally passionate commitment to supporting the Jewish community. The May 22 event celebrating the ITTP, a project of the Herb Iris Youth and Family Philanthropy Endowment, encourages teen participants to put lessons in giving into practice by both raising and allocating their own funds. The program was conceived in 2007 as a one-year pilot project, but enthusiasm for its successes resulted in its being extended into a second year. It now encompasses a “junior” first-year group and a “senior” group who mentor the first-year participants. The teens spend those two years reviewing community philanthropic agencies to decide which will be the recipients of their pooled resources. Throughout the two years, meetings and programs take place with community leaders, experienced philanthropists, and other experts. This year, the teens allocated $15,525 to five local agencies and three national groups. Teens who are accepted into the program contribute $200 of their own money, which is matched dollar for dollar by the Herb Iris Youth and Family Philanthropy Endowment. In addition, as with the most recent class, there is a chance to raise additional money with a “challenge grant” by program founder Milly Iris, who matches extra funds the teen may raise. This year the theme was “Change for Change” and had teens collecting loose change, which was then matched by Iris, netting nearly $750 in additional money. The program was developed in the months after the death of Milly’s husband, Herb Iris, a builder and supporter of local Jewish causes, in April 2006. Kim Hirsh, Jewish Community Foundation of MetroWest development officer, recalled the outpouring of love for Herb Iris and the desire of so many to make contributions in his memory. Milly Iris and her family met with the foundation and decided to create a tzedaka project for teens, a group both Herb and Milly, who now oversees the project, felt were extremely important in the continuity of Jewish giving. Sunday evening, Milly Iris and her daughter Roree Iris-Williams talked to the more than 110 people present about how important giving had been to Herb Iris. Iris-Williams said the teens are learning life-long skills that will be useful in their roles as Jewish community leaders. Holding a jar of rocks representing all the major components in life — like family and work — Iris-Williams said the jar looked full. But everything in life — including time for tzedaka, is always possible — as small pebbles of sand, representing the opportunity to help others, drifted down among the rocks. “There’s always more room” for doing good, she said. 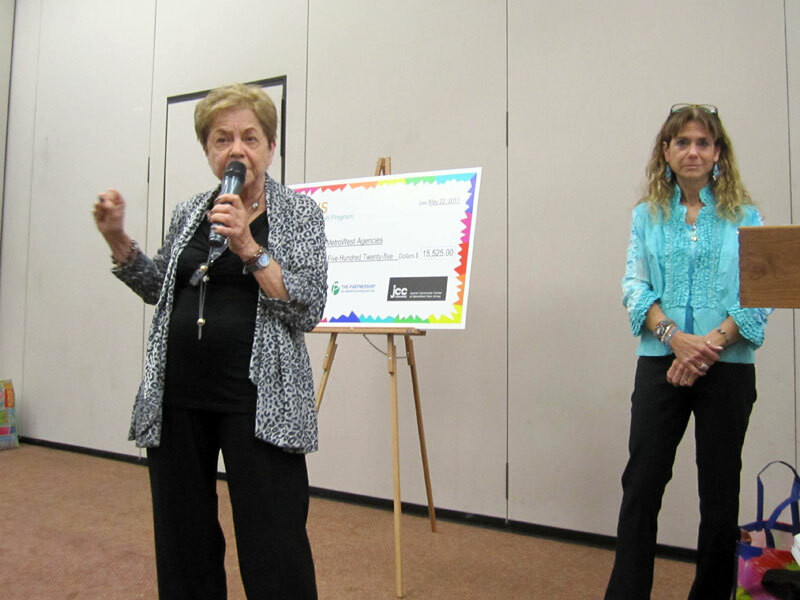 The Partnership for Jewish Learning and Life is the lead United Jewish Communities of MetroWest agency that together with the Jewish Community Foundation and JCC MetroWest brings Jewish learning to life through the Iris Teen Tzedakah program. For more information, contact Rabbi Shmuel Greene at The Partnership at sgreene@thepartnershipnj.org.